Our Room Temperature Curable Carbon Filled Electrically Conductive Epoxy G6E-RTC is developed and formulated primarily for applications requiring curing at ambient room temperature. G6E-RTC epoxy is formulated with proprietary nanomaterials and fillers to provide its performance characteristics. Room temperature curing eliminates the need for heating items to allow easier and safer connection of conductive components or materials. G6E-RTC epoxy is an ideal choice for applications involving heat sensitivity. G6E-RTC epoxy is low cost (compared to silver), non-metallic with good electrical conductivity characteristics. 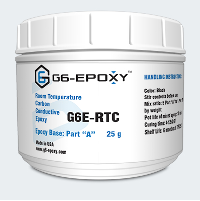 G6E-RTC epoxy is ideal for applications involving manufacture or repair of conductive or temperature sensitive components. Ideal uses for G6E-RTC epoxy include printed circuit board and EMI/RFI shielding assembly and repair, and many other similar applications. THE MIX RATIO: Mix 100 (Part A) to 20 (Part B) by weight. MIXING INSTRUCTIONS: Stir both components before use. Add Part B to Part A and mix slowly until uniform in a separate container. SAFETY & HANDLING: Always read both SDS before use. Use the product with adequate ventilation. Keep away from sparks and open flames. Avoid prolonged contact with skin and breathing of vapors. Wash with soap and water to remove from skin. PACKAGING: Part A and Part B (packaged in individual jars). This epoxy can also be supplied in bulk quantities based upon the customer’s requirements.